Nestle Canada has launched “Strange Animal”, a commercial designed to show us how the morning isn’t right until that first cup of Nescafe 3 in 1 coffee. 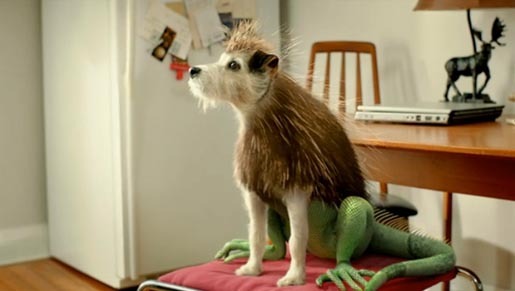 A young man walks into the kitchen to discover a dog/porcupine/lizard hybrid waiting for him. “New Nescafe 3 in 1. Coffee, whitener and sugar. Now That makes sense”. The Strange Animal was commissioned at Nestlé, Toronto, by marketing directors Jane Mackasey and Jeremy Oxley, marketing managers Rosa Francavilla and Erin Matier, and assistant marketing manager Jeanette Calzada. The ad was developed at Publicis Canada, Toronto, by creative director Duncan Bruce, associate creative director Mark Spalding, copywriter David Savoie, agency producer Siobhan Quinn, account director Christine McArthur and account supervisor Tracy Levar. Filming was shot by director Russ Lamoureux via OPC, Toronto, with executive producers Harland Weiss, Donovan Boden, producer Dwight Phipps and director of photography Chris Mably. Editor was Melanie Hider at Bijou Editorial with assistant editor Cian McDevitt and executive producer Tory Osler. Colorist was Bill Ferwerda at Notch. Visual effects were produced at Tantrum Design by VFX supervisor Dominik Bochenski, producer Victoria Holt, compositor Mike MacInnis, 3D artists Dominik Wojtarowicz and James Higuchi, animator Jimmy Gill, modeller Matt Crookshank and concept artist Alexandre Cote. Sound was produced at Pirate Toronto by director Vanya Drakul, audio producer Tyna Maerzke, engineer Spencer Hall and composer (for Nestlé Mnemonic) Brendan Quinn.